Welcome to Duck Deals Waterfowl Club. Thank you for stopping by. If you made it here I am guessing you are passionate about duck hunting and just as passionate about duck hunting gear. Here at DD we aim to create a community of duck hunters who love to be out in the field calling birds, spending time with friends, passing on traditions and creating memories. 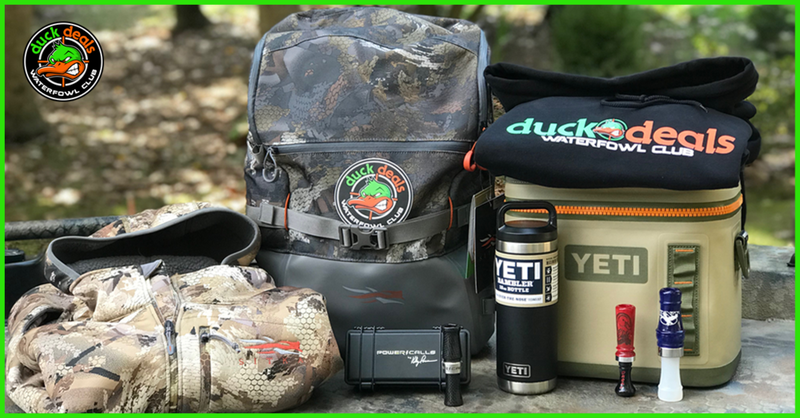 It is our goal to use our buying power, online presence and relationships with our vendors to bring as much high-end gear we can afford to get our hands and do one simple thing with ALL of it... GIVE IT AWAY TO OUR MEMBERS! Take a few minutes to take a look around our site. By clicking the menu tab above you will find links to all of our pages. In the GALLERY section where we post many of our favorite pics we receive from our fans. The JOIN section will direct you to our become a full member area. HOW IT WORKS will give you the run down on what we do and how we do it. Need more info? Check out the CONTACT area. Want to see who ALL our lucky daily weekly and monthly winners are? Visit the WINNERS area. The more the merrier, so jump on in - click the JOIN link above and get yourself signed up to the most unique club of its kind made by duck hunters for duck hunters. Everyone loves free gear, get yourself some today!